We are delighted to announce that JAM has been shortlisted in two categories for the Talk of Manchester Awards, AKA #TheTOMs! We’re up for Best PR Company (category three) and Best Full Service Agency (category five) and JAM needs your your vote! 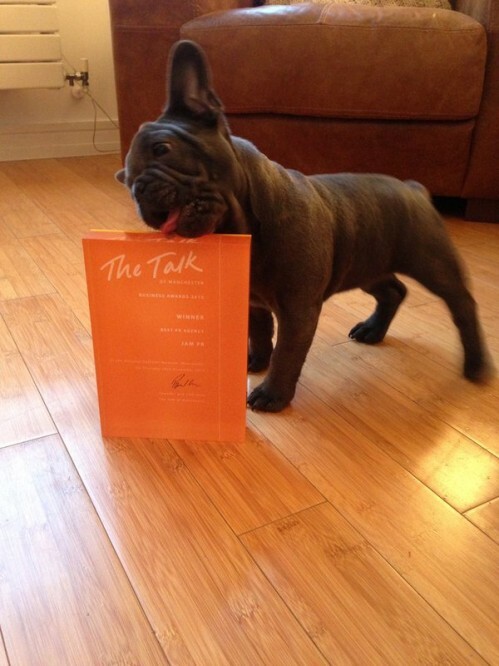 Our main mutt, Maurice loves #TheTOMs and would love it if you’d help us bag another…. We were lucky enough to win #TheTOMs Best PR Agency Award in 2013 and we’d love to add another string to our bow at this year’s ceremony. It’s an honour to be rubbing shoulders with the crème de la crème of Manchester, so to be nominated is a great achievement. 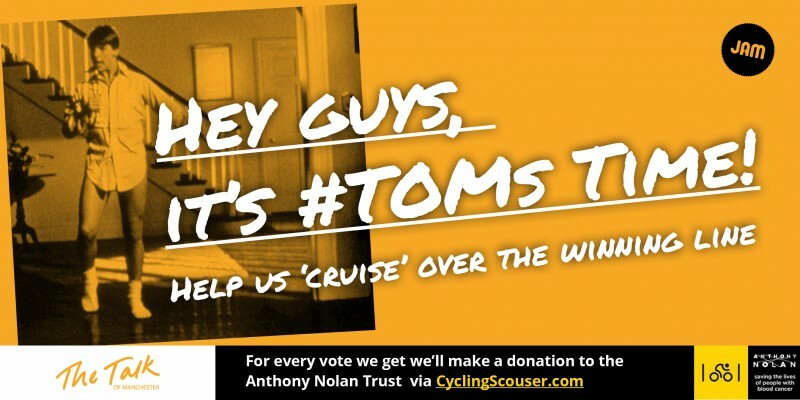 But we’d really love a win and we can’t do it without your vote! Please click here and vote for JAM in categories three and five. Life in the old dog and bone? As communicators, we like to embrace all means and methods of communication, but we have noticed, of late, that we don’t hear that familiar ring ring of the telephone very often. Until last week…when the editor of a leading PR industry title CALLED US! He is someone we hound regularly, mainly via his voicemail, email and Twitter but the phone call was a lovely surprise. We had a very productive chat, found out lots about him, as well as what he is looking for, for his next article. All in all, everyone was happy. We call editors regularly and tend to communicate with them over email too. We use Twitter and LinkedIn to reach out to them from a different angle and the same applies to clients, suppliers, and wider industry contacts. But in this brave new world of communication, are we actually speaking less? Research* shows that more than three quarters of adults in the UK own a smartphone but the number of people making phone calls is falling, as just three quarters of smartphone users make one voice call a week. We feel more connected than ever as we seem to be constantly engaged in a conversation or dialogue of some sort, whether it be over text, Whatsapp, Facebook, Twitter or Instagram, but are we really focused on that discussion? This is where the phone call wins as it’s a quick fire dialogue, requires immediate attention and allows us to relate to the other person and often glean more information, emotion and satisfaction from the conversation. It may be over 130 years old, but we’re championing a revival of the telephone and talking to people, using it as Alexander Graham Bell intended. 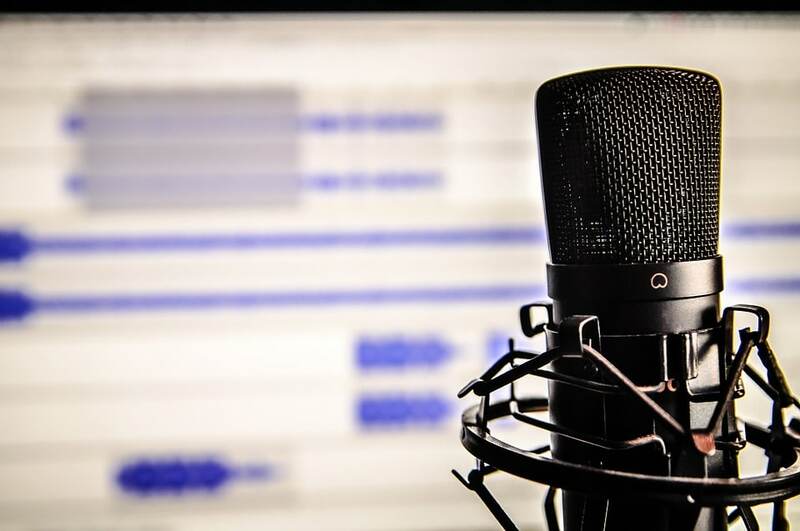 So expect to hear from us soon, or call us anytime – whether it’s to find out more about one of our clients or campaigns, or to speak to us about how we can help your business with public relations or creative activity – and we’d be happy to talk! With social media, one size most certainly does not fit all – a fact that was highlighted this week at Engage 2015, the world’s best social media business summit, hosted by Socialbakers. A stellar line up of speakers, including Universal Music, Desigual, Loreal, the BBC and even NATO enlightened attendees, on the very different, yet highly targeted, approaches they all adopt in reaching their audiences via digital. No two strategies were the same but there was a very common theme – storytelling. Incredible insight was gleaned from the conference (more below) but something that stood out, which caused a gentle sigh of relief to ripple throughout the room, was NATO’s Steven Mehringer confessing that they too have to educate their leaders on social media and the benefits of it. We’re all in the same boat, after all. Pun very much intended. Despite close to 1.7 billion people having active social media accounts (source: Jeff Bullas), some leaders are still a little hesitant to tap into this information hungry audience. But perhaps this hesitancy stems from a lack of clear objectives and measurement, rather than a lack of understanding. The nature of your business will ultimately set your objectives. NATO, for example, isn’t actively selling anything tangible, yet Desigual has a load of clothes to shift. Desigual’s Dimi Karavasilis explained how they use the website as an e-commerce hub and social media channels as traffic generators with different roles‬, with each channel telling a different story. One other nugget from Desigual; their influencer management is conducted through agency, allowing a single team to build those vital relationships and manage them closely. Prospective clients, I’m just sayin’. Universal Music’s, Olivier Robert-Murphy announced that people would not care if 73 per cent of brands disappeared tomorrow. Ouch! Brands must adapt to survive, focusing on something more meaningful – storytelling. He argued that we are no longer selling products, we’re selling emotions, lifestyles and solutions. 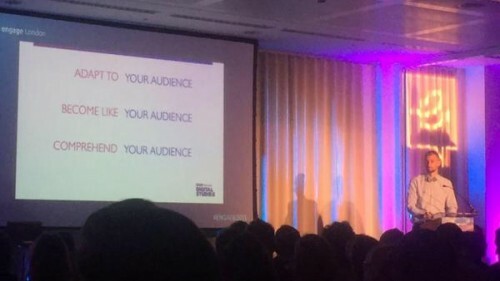 In order to do this we must conduct audience-led storytelling, according to BBC Worldwide Digital Studios. Alex Ayling advised to become like your audience by putting them at the heart of digital content. Loreal’s Alex Onish utilises employee engagement campaigns to harness the power of employees’ networks, effectively making them brand guardians. 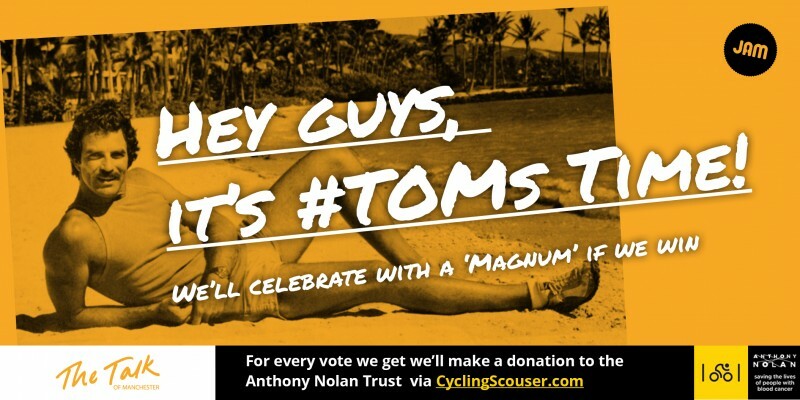 Cue shameless plug for our very own Employee Motivation Day campaign from Argos for Business. Alex also declared that, thanks to many organisations blocking social media channels on desktops, “40% of young adults use social media in the bathroom. The other 60% are lying.” Lovely. Social media measurement also differs from brand to brand. NATO focuses on indirect messaging, whereby key influencers deliver the same message across NATO’s digital channels. It also tracks awareness (views), appreciation (likes / shares), action (clicks) and advocacy (long-term support). Desigual counts earned media. Earned media (mentions, shares, reposts, reviews) is the vehicle that drives traffic to Desigual’s e-commerce site, translating to sales. The takeaway message from Engage 2015 – storytelling, with context. If you’d like support with your social media storytelling contact Jaime@jampr.co.uk to discuss your objectives. As specialists in digital PR, we like to keep a close eye on new developments in the world of social media – especially if they involve shopping! 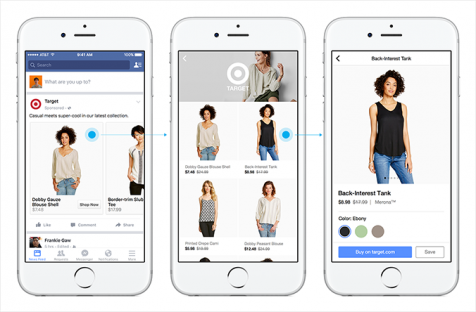 So we were very interested (and concerned for our bank balances) to learn that Facebook has decided to challenge the likes of Amazon and ebay by making mobile shopping easier via its own app. Previously, if Facebookers wanted to find out more about a product advertised, they would click on the advert and be directed to retailer websites that would often take a while to load and/or were not mobile optimised…Always a sure fire way to put off potential customers! Facebook’s name for its new ‘immersive ads’, Canvas is something the company hopes will solve the problem of slow-loading websites. After clicking on an ad, users will see a fast-loading, full screen page which allows merchants to display whole product catalogues that load within Facebook instead of taking them to a different website. This provides a whole host of new temptations for shopaholics, without the annoying wait. Fantastic for retailers but not so good for impulse buyers, Facebook’s ‘Buy Button’ now appears in ads within the News Feed, allowing users to purchase products directly from a business without even leaving the social network. 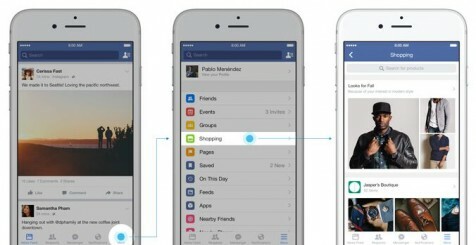 Accessible from the Favourites section of the navigation menu, and personalised based on such things as your Facebook connections, likes and interests; the new Shopping Feed is a single place to browse different products being showcased across the site without those inane status updates and close-up selfies getting in the way. So with Facebook increasingly becoming a place to connect with existing and potential customers, businesses need to recognise the important role it plays in their PR and marketing strategy. While some users simply want to keep in touch with long lost friends and post travel photos and group selfies, there is definitely an appetite for extending Facebook’s uses, and in-app shopping seems like the next natural step so businesses should embrace this as a new retail channel. We are especially guilty of excessive prosecco popping at JAM towers. However, this ever-popular Go Sober campaign from Macmillan Cancer Support is achieving lots of fantastic coverage, based on its shocking survey results. The charity found that the British public spends £2.6million on alcohol per hour. If that’s not enough to have you snapping your purse shut and running from the bar, screaming, we don’t know what is. 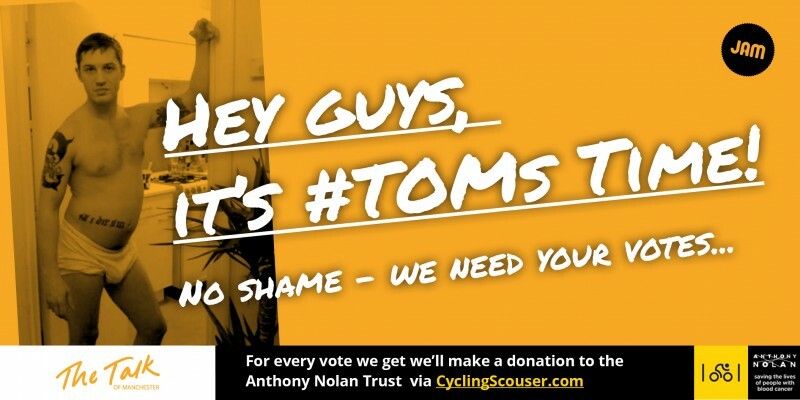 As the title of this blog suggests, we have been doing our bit to support a remarkable charity. 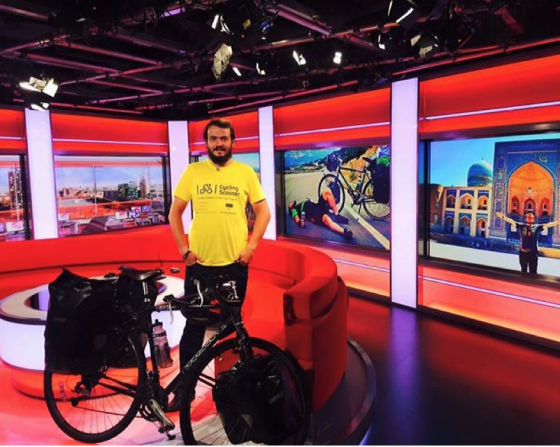 We’ve been supporting Cycling Scouser to help raise awareness of his epic five-month bike-ride from China to the UK, in aid of Anthony Nolan. Andrew “Rogo” Rogerson is a real-life superhero and has managed to raise over £19,000 so far for the blood cancer charity. The PR team pulled out all the stops to welcome him home, arranging camera crews and radio stations to meet him at the finish line, as well as a media day at MediaCityUK, where he was interviewed by Lucy Meacock on ITV Granada Reports and Annabel Tiffin on BBC North West Tonight. The creative arm of team JAM is working on an exciting charity project in connection with Survivors Manchester and GF Smith to raise awareness for men’s mental health. The project will pair 10 charity organisations in Greater Manchester with a creative agency within each area, to collaborate on awareness posters, culminating in a huge exhibition in the new year. If you are a charity or know of a charity requiring PR or creative support, we’d love to hear from you. Tweet us or drop us an email (Jaime@jampr.co.uk) to discuss your requirements. We’re excited to announce that we have has been appointed to handle public relations activity for Bierkeller Entertainment Complex (Manchester), to drive awareness of the popular leisure venue in the North West region and nationally. Based in The Printworks in Manchester city centre, Bierkeller Entertainment Complex is a unique drinking, dining, sports and live music destination. We are tasked with raising the profile of its four venues, which include Ski Lodge bar, Around The World specialist beer bar, Shooters Sports bar, and a Bavarian style bar – Bierkeller. We will carry out a strategic regional and nationwide PR campaign targeting North West food and drink, restaurant and lifestyle media, websites, national newspapers and online portals, as well as blogger outreach activity. Jaime Gee, our MD, added: “We’re so excited to be working with such a popular leisure venue and we’re looking forward to creating a buzz for Bierkeller Entertainment Complex, especially as the new intake of students arrives in the city and in the run up to the busy Christmas period and beyond. Bierkeller Entertainment Complex is part of the Burning Night Group. In addition, we are shortlisted in the MPA Awards and the CIPR PRide North West Awards for our Employee Motivation Day campaign for Argos for Business – wish us luck!